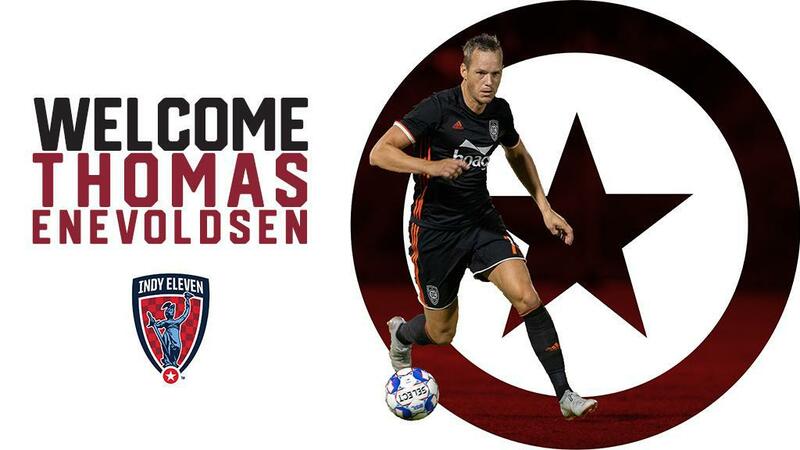 Indy Eleven Professional Soccer is pleased to announce the signing of forward Thomas Enevoldsen ahead of the 2019 USL Championship season, pending league and federation approval. Enevoldsen, 31, started in 37 full-time appearances for USL Championship Western Conference side Orange County SC in 2018. The Danish striker earned a spot on the 2018 USL Championship All-League First Team after he netted 20 goals and 10 assists in all appearances. Enevoldsen’s performance placed him among USL Championship MVP finalists for 2018. Prior to his USL Championship career, the Aalborg, Denmark native enjoyed stints with Aalborg BK (Danish Superliga), FC Groningen (Eredivisie), KV Mechelen (Belgian Pro League) and NAC Breda (Eredivisie) between 2005-2018. Enevoldsen earned Superliga championship honors with in the 2007-2008 season with Aalborg BK. Enevoldsen also made appearances in the 2007-2008 UEFA Cup, most notably scoring against English Premier League side Tottenham Hotspur FC at White Hart Lane. The following season, Enevoldsen made UFEA Champions League appearances against Manchester United FC, Villarreal CF and Celtic FC. In addition to his club play, Enevoldsen represented Denmark on a national level with caps on the U18, U19, U20, U21 and senior level. Enevoldsen scored his first international goal on May 27, 2010 in Denmark’s 2-0 win against Senegal. Enevoldsen made a single World Cup appearance that same year as a substitute in Denmark’s 1-2 loss to Cameroon. Don't miss any of the action this season. Get your 17-home game 2019 Season Ticket package today for as low as $99! Visit IndyEleven.com/Season-Tickets or call (317)685-1100 for more details.